Living Space: 4300 sq. ft.
Nestled in a private beachfront location on the secluded beaches of Rocas de Amancio make this a stunning property unlike any other. Ideally situated on one of the most intriguing beaches in Costa Rica, the swirling waves flowing in and out of the rock formations will amaze even the most seasoned traveler. As an added convenience, all of the amenities of the Dominical Beach town are just minutes away. The property is nearly a quarter acre in size and it comes with a well-built main house villa, guest house villa, caretaker’s cottage, and a pool / rancho area. Furniture and appliances are included to provide for a turnkey option that is suitcase ready to occupy and to rent out immediately for income. Built in 2007, all structures have AC units, ceiling fans, cable, and internet in place for each villa. Also present are LAN line phone connections and excellent cell phone reception. The 3,000 square foot main house consists of a three story, two bedroom, two full bathroom villa with large outdoor living balcony areas that looks right out to the Southern Pacific Ocean. A 2 car garage is located adjacent to the main home for easy and covered home entry access. Included are a 2 person Jacuzzi tub and a large size swimming pool with a wraparound deck for sun worshippers. Adjacent to the main house and pool is the convenience of a rancho including an outside cookout and dining area. From there a graveled path leads you past the mature landscaping area and right to the ocean. Independent of the main home is a 700 square foot one bedroom, one bath guest house. Both the main and guest homes may be rented out together or separately. Next to the guest home is a 600 square foot studio caretaker’s cottage where an employee may reside and manage over the property. If you must be right on the ocean and you desire an income producing asset, this property is a perfect fit. Every day the roar of the ocean and spectacular South Pacific Costa Rica sunsets are right in front of you. 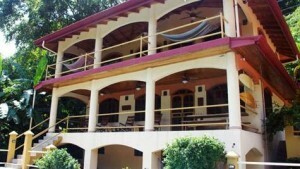 Don’t miss out on this opportunity to acquire unique beach front homes on the Southern Pacific Coast of Costa Rica!